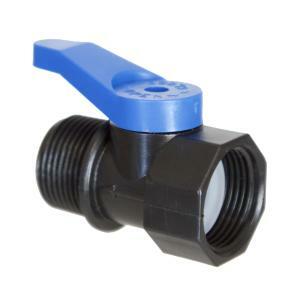 This is a female x male threads mini ball valve adapter. Available in either NPT (national pipe threads) or GHT (garden hose threads). Use wherever you need on/off functionality. Great for tight spaces, valve measures less than 2-1/2" in length. WARNING: This product can expose you to chemicals, including Diisononyl Phthalates, which are know to the State of California to cause cancer and Diisononyl Phthalates, Lead and Bisphenol-A which are known to the State of California to cause birth defects or other reproductive harm. For more information go to www.P65Warnings.ca.gov.